viking hot tubs- Sunny's Pools & More! Now that your tax return is filed and you have money in the bank, why not spoil yourself? What can be more relaxing after a hard day of work than your very own Viking Spa? Owning your own spa is way better than the local dirty one at the gym. With your own spa, you can relax in private and not have to share your time with a bunch of strangers. You can also invite friends and family that you actually like to enjoy the spa with you. At Sunny’s Pools & More, we have everything you need to get your hot tub up and running for years of enjoyment. In addition, we have all the accessories, chemicals, steps, and covers you need to complete your hot tub. 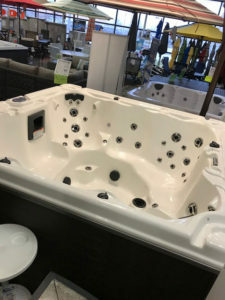 If you do not want to spend your tax return, that is great too, because we have 60-month financing on hot tubs available. You will save thousands on all our hot tubs, just visit your local Sunny’s today. Of course, we have much more than hot tubs available. Are you looking for a swimming pool for the whole family? Now is the time to buy and beat the spring rush. We have semi-inground and above ground pools available. Need water testing or chemicals? We have all the chemicals you need to keep your pool clean and running all season. Also, pool ladders, filters, cleaners, and just about anything you can think of is available at Sunny’s Pools & More. Now not everyone is an outdoor type person, we have you covered there as well. Along with hot tubs and pools, Sunny’s Pools & More carries a great lineup of game room items. From pool tables to shuffleboard, we have everything you need to deck out your game room. No matter what you are looking to spend your tax return on, make sure you visit your local Sunny’s Pools & More to see all the great deals available today!